If you have made the decision to look at Static Caravans for sale with a view to purchasing your Holiday Home, one of the most popular models we sell is the Cypress 10 Supreme model from the Europa Range. Boasting a contemporary design, spacious rooms and with the choice to specify your individual requirements on certain options, you will be guaranteed an affordable, comfortable, Static Caravan. Available in many different sizes, choose from the smaller range of one or two bedroomed models at 26 feet long, varying other options and optional widths, or select the family model at 35 feet wide offering a configuration of one double and two twin bedrooms. Standard features included are UPVC single glazed windows (with an option to upgrade to double glazing) and aluminium doors, with a pan tiled roof. 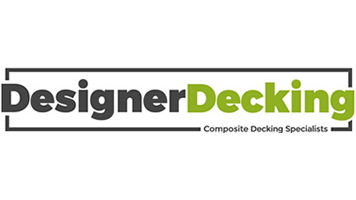 Constructed with an attractive wood grained aluminium exterior or the alternative option of an environmental green exterior finish, to blend in with countryside surroundings, depending on your chosen site location. A feeling of space in the lounge is created with the vaulted ceiling and panoramic windows fitted with contemporary styled curtains. 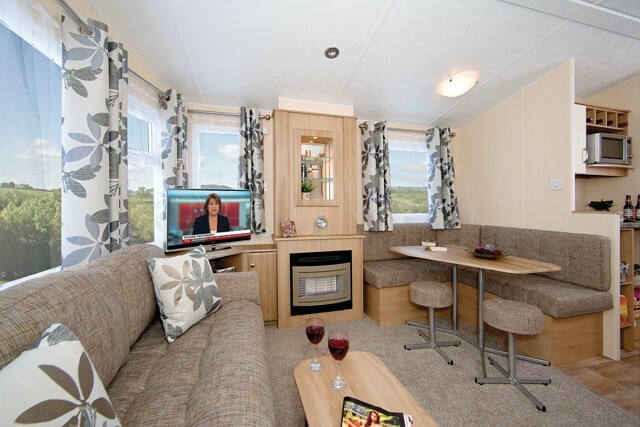 This style is continued throughout the caravan with comfortable seating, including a fold out sofa bed and carpeted area to the lounge. Domestic styled MDF interior doors are included to the lounge and kitchen with light wood finished furniture, built in shelving above the fitted gas fire and a matching television stand unit. To guarantee additional comfort and heating, opt for the central heating or electric panel heaters, or maybe for additional insulation. The dining layout comes with fixed seating and a dinette table as standard, with an added choice available to upgrade to a free standing dining table and chairs, if preferred. The fitted kitchen offers generous storage in a light wood finish to compliment the lounge and dining room furniture. The standard model comes with space for you to add your own fridge or freezer, or why not chose the added option of having them supplied. An oven and hob with drop down glass cover is accompanied by an integrated cooker hood and outside vent. Generous storage and shelving is offered in the standard model, with over-bed units and dressing table style fixture in the double bedroom. The large family bathroom has a walk-in, full height shower. All in all, an attractive, well priced Holiday Home designed with comfort and relaxation in mind. We are here at North Wales Caravans, with our extensive knowledge of the Holiday Home industry, to assist with your choice, take you to view caravans for sale and answer any questions you may have regarding the initial purchase, including advice and any help you may need with the financial aspects of owning a Holiday Home.